If you are pregnant after fertility problems, there is a brand new closed Facebook group that you can join. It is a closed space to talk to one another, to share experiences and to find news and information about pregnancy, birth and early parenting. Did you know that the charity Fertility Network UK now has a special online group meeting every month for those who are pregnant after fertility problems? The group is open to everyone and will have expert speakers from time to time who will can offer tips and advice and answer questions. I’m really interested in the subject of pregnancy after fertility problems – there’s often an assumption that the years of trying to conceive disappear the instant you see a positive pregnancy test, but I think there’s a growing recognition that maybe it’s not quite that simple. I was really delighted to be asked to speak at a workshop in Haywards Heath called Time to Heal organised by local midwives there – you can find them at @@BSUH_TIME2HEAL on Twitter. There were so many fantastic speakers and the audience were very receptive and interested. When I was pregnant after IVF, I had two brilliant midwives who made me realise that just because I’d had problems getting pregnant, it didn’t mean that I was automatically going to have problems being pregnant. 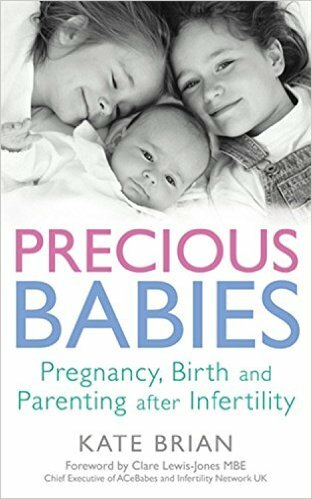 I went on to write a book about this – Precious Babies: Pregnancy, Birth and Parenting after Infertility – because I felt so strongly about the issue. I think my main feeling about this is that pregnancy after fertility problems is different but that it doesn’t mean a woman necessarily needs additional medical support – but what many of us could do with is some additional emotional support and understanding. This was a theme very much reflected by many of those attending the workshop, and I hope that going forwards this will be better understood.